They found the newer samples appeared not to multiply as well, and were more sensitive to drugs - some other studies argue they are becoming more resistant. The researchers, writing in the journal Aids, stressed their work in no way meant efforts to prevent the spread of HIV should be scaled down. They were only able to compare 12 samples from each time period, and they were unable fully to tease out any effect that drug therapy may have had on the virus. Researcher Dr Eric Arts said: "This was a very preliminary study, but we did find a pretty striking observation in that the viruses from the 2000s are much weaker than the viruses from the eighties. "Obviously this virus is still causing death, although it may be causing death at a slower rate of progression now. Maybe in another 50 to 60 years we might see this virus not causing death." Keith Alcorn, senior editor at the HIV information charity NAM, said it had been thought that HIV would increase in virulence as it passed through more and more human hosts. But the latest study suggested the opposite is actually true. "What appears to be happening is that by the time HIV passes from one person to another, it has already toned down some of its most pathogenic effects in response to its host's immune system," he said. "So the virus that is passed on is less 'fit' each time. 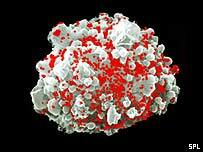 "This would suggest that over several generations, HIV could become less harmful to its human hosts. "However, we are still far from that point - HIV is still a life-threatening infection." Dr Marco Vitoria, an HIV expert at the World Health Organization, said other diseases - such as smallpox, TB and syphilis - had shown the same tendency to weaken over time. "There is a natural trend to reach an 'equilibrium' between the agent and the host interests, in order to guarantee concomitant survival for a longer time," he said. However, Dr Vitoria stressed that the latest findings should not lull people into a false sense of security. "This kind of change cannot be adequately measured in years, but in generations," he told the BBC News website. He also questioned whether it was possible to draw firm conclusions from such a small study. Will Nutland, of the charity Terrence Higgins Trust, said: "This latest study adds to the debate on an apparently confusing and contradictory issue. "Some studies suggest recent strains of HIV are more sensitive to drugs while others claim strains are becoming more resistant. "The study adds to the body of evidence but HIV is showing no signs of dying out in the near future."